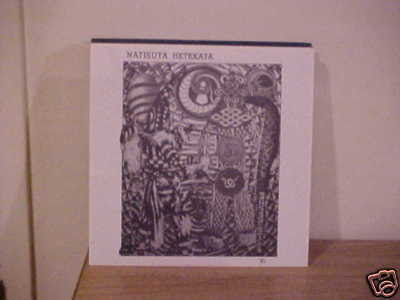 Natisuta Hetekata is a Japanese band living in Finland and even better, they sound like it. Imagine a hybrid of Avarus/Maniacs Dream and Acid Mothers Temple .Truly amazing lyserging sounds ,like Acid Mother Temple jamming with Boris ! Their 10" is even better. And the truth is these guys weren't Japanese. The names on the album are Japanese ski-jumpers and the band consisted of members of Radiopuhelimet, Jolly jumpers etc. Sorry to burst the bubble...and indeed, the 10" is really good stuff too. Something I've been looking for..."Wilt" by Blue Daisies. Given all the Steaming Coils you've got posted, I wonder whether you've got it. My copy is trashed and I haven't been able to find a replacement for love or money. The headline is misleading. At least mention that this record was on the legendary Majora imprint based out of Seattle, which is located in neither Japan or Finland. I always heard this was actually Tom Verlaine, Rick Bishop, and Bubba Dupree sitting in with Bardo Pond. Five-guitar lineup!